Magnetic Particle testing is done by inducing a magnetic field in a ferromagnetic material and dusting the surface with iron particles. Surface imperfections will distort the magnetic field and concentrate the iron particles, near the imperfections, thus indicating their presence. 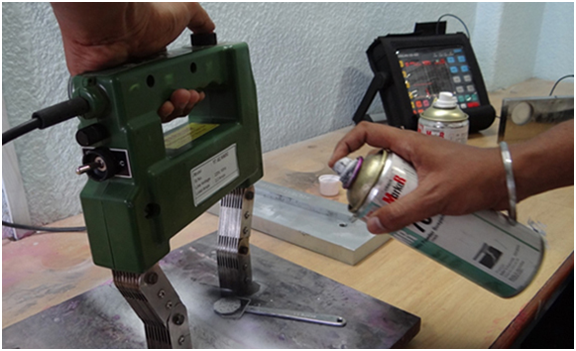 Magnetic Particle Testing is used to detect surface & subsurface defects. Magnetic Particle Testing can be performed only on ferromagnetic material. Ferromagnetic means material which can be easily magnetized. The process includes magnetizing the material with passing currents. Later, a coat of iron powder is applied to the surface, which helps identify cracks and possibility of leakages in the material.